"My 13-year-old daughter created this recipe for a quick yummy summer snack. Easy for anyone to make and enjoy." Beat milk and pudding mix together in a bowl using an electric mixer until thickened, about 2 minutes. Measure 1 1/2 cup pudding and set remaining pudding aside for another use. Sprinkle graham cracker crumbs into the bottom of each ice pop mold; add about 1/4 cup ice cream. Sprinkle another layer of graham cracker crumbs and top with about 1/4 cup pudding. Add a final layer of graham cracker crumbs. Freeze until completely frozen, about 3 hours. 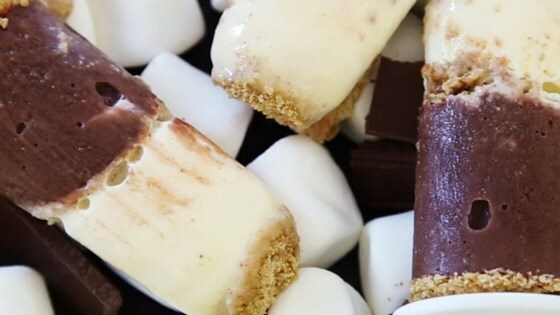 Here's an icy version of everyone's favorite campfire dessert. Before you take the Popsicle® out of its individual mold, run it under hot water to loosen so it is easier to pull out. I use Zoku® molds. Nutrition data for this recipe includes the full amount of pudding. The actual amount of pudding consumed will vary.